Rub bottom of heavy 4-quart saucepan with garlic clove; discard clove. Add caraway seeds to pan and roast over medium-high heat, stirring constantly, until fragrant, about 1-2 minutes. 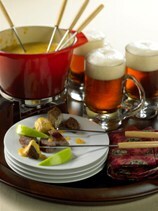 Pour beer into pot; stir until foam dissipates. Stir in lemon juice and sugar. Bring mixture to a boil; add sausage pieces, reduce heat to medium-low and simmer, uncovered 8-10 minutes. Remove sausage from pot with slotted spoon; cover with foil to keep warm. Leave beer mixture over low heat. In large bowl, toss cheese with flour until evenly coated. Slowly whisk in beer mixture, one-half cup at a time, stirring until melted. Whisk in Worcestershire sauce, mustard, salt and cayenne pepper until blended. Transfer mixture to warm 1 ½ quart fondue pot, or small slow cooker set on low. Serve with sausage slices, chunks of bread, apple slices and potato cubes.